Now that's what I call a census fragment! 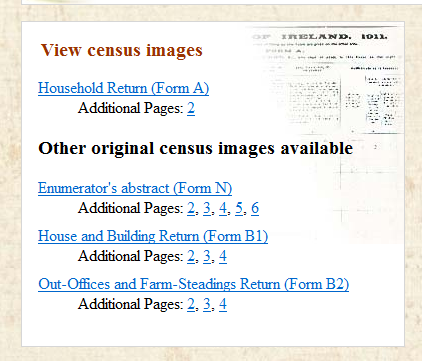 The National Archives of Ireland's collections of pre-1901 census fragments and census search forms (a total of around 600,000 records) have been uploaded to the NAI's free Genealogy site, along with explanatory contextual images and text. The database will also be available, free of charge, at FindMyPast and Family Search. The 19th-century census fragments are surviving returns from the censuses taken in Ireland in 1821, 1831, 1841 and 1851. There are considerably more entries than I expected to see, but some don't have locations, ages, relationships to household etc, ie all the important geneaogical stuff. But even those incomplete entries may help some researchers. The Census Search Forms were the documents completed by those wishing to 'prove' their age to support an application for a state pension, following its introduction in 1908. 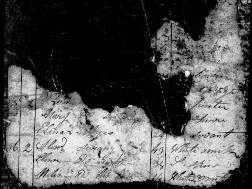 A search was made of the paper returns for the 1841 and 1851 censuses (which had not been destroyed at this time) to see if the applicant could be identified. Whether 'found' or not, these search forms often hold terrific genealogical information, as information they provided about their parents and siblings was often noted on the form. They're often erroneously referred to as Irish pension records. Again, these forms will knock down some brickwalls. Search the census search forms. You also might like to listen to Brian Donovan of FindMyPast.ie who was interviewed on the John Murray RTE show this morning. He talks about the relevance of these records and the information contained within them (ie 1841 & 1851 censuses asked who had died since the previous census or who was temporarily absent from the household). While he describes census records as the 'goldbar' of genealogical data, he says FMP will be digitising some 80million records for the National Archives alone over the next two years. He also gives some examples of entries. You can listen here. Shuffle along to 49minutes 53secs. A new website holding photographs, transcriptions and an interactive map of one of Ireland's largest cemeteries was launched on Friday night at the Beyond the Grave conference in Limerick. 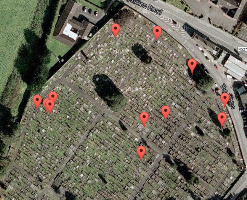 At http://mountsaintlawrence.limerick.ie/ researchers can search and view images of 7,000+ gravemarkers in Mount Saint Lawrence cemetery and find the exact location of individual burial plots on an efficient interactive map. In addition, headstones in the cemetery's Sections A-H have been transcribed and can be searched by an individual's name and year of death. There are more than 12,000 individuals recorded in this database. The map will only identify graves with headstones or markers; you will not find a grave without a headstone. If you believe your ancestor was buried here but you can't find them in the database, check out the Burial Register Transcriptions. Transcribing the registers formed Phase I of the Mount Saint Lawrence Project, which was completed about 18 months ago. The project was carried out in a partnership between Limerick City Archives and the staff and students of the History and Geography Departments of Mary Immaculate College. Phase II was carried out over the past two years by more than 350 volunteers who photographed and transcribed grave markers throughout the 18-acre site. Monday 28 April: Citizen soldiers: Irish political militarism in the Atlantic World 1778-1914, witih Dr Christopher Loughlin. Host: Institute of Irish Studies. Venue: First floor, IIS, QUB, 8 Fitzwilliam Street, Belfast. 1–2pm. Free. Tuesday 29 April: The Brian Boru Harp and its musical legacy, with Dr Janet Harbison. Host: Dublin City Library & Archive. Venue: Council Chamber, Dublin City Hall, Dame Street, Dublin 2. 1:10pm to 1:50pm. Free. All welcome. No booking required. Tuesday 29 April: The Irish census, including the newly launched fragments and search forms, with Catriona Crowe. Host: Kilrush and District Historical Society. Venue: Teach Ceoil, Grace Street, Kilrush, Co Clare. 8pm. Wednesday 30 April: Using DNA to help research your Northern Irish Family Tree, with Dr Maurice Gleeson. Host: North of Ireland Family History Society, Ballymena Branch. Venue: Michelin Arts Workshop, Braid Arts Centre, 1-29 Bridge Street, Ballymena, BT43 5EJ. 7:15pm. Wednesday 30 April: Reaching Out Together information session, with Reaching Out and Ancestry.com. Learn about reverse genealogy and using Ancestry's databases. Venue: Moylough Community Centre, Co Galway. 8pm. Free and open to the public. Register for the event by contacting the Ireland XO office on 091 842013 or roadshow@irelandxo.com. Wednesday 30 April: Christianising Mayo, with Chris Corlett. Host: The Mayo Historical & Archaeological Society in association with the Heritage Studies Dept., GMIT. Venue: GMIT Campus, Castlebar, Co Mayo. 8pm. All welcome. Wednesday 30 April: The River Bann: a view from the archives, with Lorraine Burke. Venue: PRONI, Titanic Boulevard, Belfast. Time: 1–2pm. Admission is FREE but booking is essential. Email proni@dcalni.gov.uk to reserve your place. Thursday 1 May to Sunday 11 May: Castleton Lanterns exhibition. Last year a box of 100-year-old glass lantern slides were discovered in the organ loft of Alexandra Presbyterian Church. The 77 slides were images of 137 men from the Castleton congregation who served in WW1. Some 31 of these men are known to have been killed in action. Can you help identify some of the other men? Venue: War Memorial Gallery, 21 Talbot St, Belfast, Co Antrim BT1 2LD. The images are also online at castletonlanterns.co.uk. You'd have had to have been living under a rock at the top of the most remote Connemara hill to have got through the last few weeks without being deafened by the criticisms and complaints against the new version search engine recently launched by FindMyPast. The racket hasn't been as loud from Ireland as it has from elsewhere, especially the UK. I suspect this is because FindMyPast Ireland and Australia/NZ (and possibly the USA, which I've never tried out) have being using a localised or similar version of this new engine since their launches, so we might be finding the leap somewhat narrower than others. That doesn't mean we're happy bunnies, of course. I've always preferred to use the UK site when searching FMP's Ireland collection; that option is no longer available because all the FindMyPast sites have moved to the new engine. FindMyPast has responded to the criticisms with a couple of videos. The first is an interview with the editor of Who Do You Think You Are? magazine where the company replies to some of the criticisms; below it is a how-to tutorial which may make the jump a little easier. Both can be viewed below. A new initiative is underway to explore the contemporary resonances of WW1. Based in Belfast, where the conflict had such a long lasting and complex effect, The Living Legacies 1914–1918 Engagement Centre will be a focal point for academics and community researchers looking at how WW1 lives on in the modern world, and aims to work with community-led research projects across the UK to help achieve greater levels of outreach and engagement beyond their immediate localities. expressing stories about the conflict through drama and theatre. The Living Legacies Engagement Centre is based at Queen's University Belfast and will be publicly launched at 6pm on Monday 19 May at the Conor Lecture Theatre, University of Ulster Belfast campus, York Street, which is in Belfast’s Cathedral Quarter. The launch will include a lecture by Professor Richard Grayson, author of Belfast Boys, as well as a short performance from Brenda Winter’s new play The Medal in in the Drawer. The National Library of Ireland has released more than 10,500 images following a digitisation project that's taken some seven years to complete. The James P O'Dea, 1910–1992 photographic collection: This will bring a happy glow to the faces of railway enthusiasts everywhere! Most of the photographs are of trains and stations, and with a mere 5340 of them, your favourite anorak should be smiling for some time. There are also 125 photos of railway employees, so worth taking a look if you've family who worked on the railways. Thomas Holmes Mason, 1877-1958 photographic collection: Dating primarily from the early 1900s to the 1940s, these photos are particularly strong on scenes of Irish industry in the first years of the 20th century. Country themes are also included. Prints and Drawings: Most of this huge upload of some 3,000 images feature portraits and drawings of more than one thousand famous and infamous figures from Irish history, mostly 19th century. Genealogical Office Manuscripts Collection: A technicolour collection of images. Really, the colours in some of the older arms are just beautiful. Tom Clarke & Kathleen Clarke Papers, 1890 -1972 collection: A photographic album of the revolutionary family. As part of its newly launched 100 in 100 project (see blogpost), which aims to release one hundred record sets in one hundred days, FindMypast has released a bundle of collections focussing on the US Civil War. You can find more details of these record sets by clicking the 100 in 100 logo above. * The book, published in 2013, will be available in the US from 1 May. 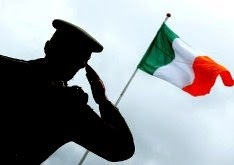 You might also like to explore Damian's excellent blog, IrishAmericanCivilWar.com. A two-day conference – The Irish Workhouse – Past & Present – will take place on the weekend of 17 and18 May in Portumna, Co. Galway. Keynote speaker is Peter Higginbotham, whose depth of knowledge about workhouses in both the UK and Ireland can be seen on his incredibly detailed website: www.workhouses.org.uk. He will be delivering two lectures, the first on workhouses in Ireland, the second on poorhouses in Scotland. Both days of the conference close with a guided tour of the Irish Workhouse Centre (IWC), the former Portumna Workhouse, where the event is being held. 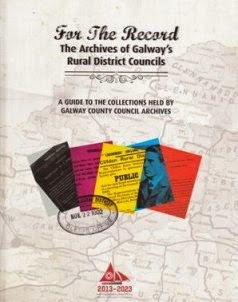 The IWC has organised the event in partnership wtih the Heritage Office of Galway County Council. Attendance fees, which include lunch and refreshments, are €60 for the two days, or €35 for one day (space permitting). You can download the conference brochure (pdf) here for full details of the lectures, programme and booking information. 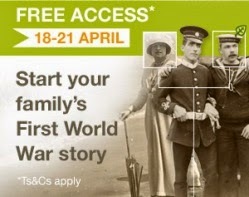 This Easter weekend, Ancestry.co.uk is offering free access to its British Military, Census and Probate collections. The offer starts tomorrow, 18 April, and continues until 23:59 on Easter Monday, 21 April. To gain access to the records, you'll need to register (only your name and email address required, no credit card details) and will then be sent a user name and password. The register for Aghaderg Church of Ireland includes the first name of the mother of the child and sometimes her maiden name. The father’s occupation was recorded between 1839 and 1870. In addition, between the years 1832 and 1838, each child had at least three sponsors! In 1728 the minister for Blaris Church of Ireland recorded some of the occupations of the fathers whose children were being baptised. We can see therefore that in the town of Lisburn at that time there was a shoemaker, saddler, potter, inn-holder, gardener, chandler, whipmaker, blacksmith, hatter, ‘joyner’, and glazier. If the father was a soldier, the name of his Regiment was often recorded in this register, particularly in the 1790s. The register for Christchurch Church of Ireland in Belfast contains the exact street address of the family, the father’s occupation and the mother’s full name including her maiden name; much like the information contained on a civil birth record but these registers date from 14 years before the start of civil registration in 1864. The minister from 1855 to 1859 also recorded the Church where the parents were married, a most useful piece of information, particularly if they had married outside of Belfast or even Ireland. Places of marriage detailed in this register include Glasgow, Edinburgh, Falkirk and Greenock in Scotland; Liverpool, Carlisle, Sefton in Lancashire, Manchester, London and Cornwall in England as well as America and Gibraltar! The register for Dromore Church of Ireland contained the name of the mother, including her maiden name. The father’s occupation was recorded from 1858. Where an online digital copy of a document is available, there is a link from the description. There are also links to full descriptive lists about each collection in pdf format for download. The landing page explains that the catalogue is a work in progress. 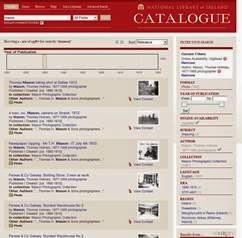 You can search the catalogue here. IrishTV is planning to launch a 24/7 television channel aimed at Ireland's diaspora on 1 May. The new channel will target the diaspora in Canada, the USA, Britain and Europe and will broadcast on Sky 191, Freesat400 and (in the US) PBS. It will also be online at Irishtv.ie. Broadcasting around the clock, IrishTV will screen 50 home-produced programmes every week, with original content from 6pm to midnight every evening. Among its flagships will be Out & About and County Matters. The latter will give each of the 32 counties of Ireland a 30-minute slot covering farming, property, history, finance, culture, traditions, rural life, sport... you name it. Each county will be able to showcase its stories to an international audience in a dedicated timeslot. Speaking to Irish Genealogy News yesterday afternoon, IrishTV's Mark Dempsey directed me to a film, viewable from the company's existing online presence, of a visit to Norrth Tipperary Genealogy & Heritage Centre, featuring genealogist Nora O'Meara, which you can see here in its short form, or here (at 46 minutes) as part of an Out &About episode based on the area. 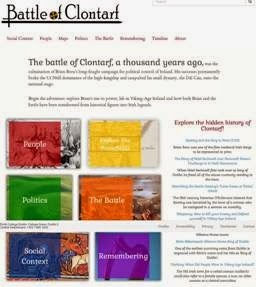 Monday 14 April: That field of glory: historical and antiquarian perspectives on the Battle of Clontarf, with Professor Colm Lennon. Part of the Battle of Clontarf commemoration series of lectures hosted by Clontarf Historical Society and Raheny Heritage Society. Venue: Clasac Theatre, Alfie Byrne Road, Clontarf, Dublin 3. 8:15pm. Members free, non-members €5. Tea and coffee after lecture. Details: Kay Lonergan, +353 1-8338711. Monday 14 April: Tracing your family in Limerick, with Paddy Waldron. Host: Limerick Historical Society. Venue: Room 301 Mary Immaculate College, South Circular Road, Limerick. 8pm. Free. All welcome. Tuesday 15 April: The Riots in Marsh's Yard, Cork, by Dermot O' Donovan. Host: Muskerry Local History Society. Venue: Ballincollig Rugby Club, Ballincollig, Co. Cork. Nominal attendance fee of €3. 8:30pm. Tuesday 15 April: The Battle of Clontarf and James Ward's Murals in Dublin's City Hall, with Dr Joseph McBrinn. Host: Dublin City Library & Archive. Venue: Council Chamber, Dublin City Hall, Dame Street, Dublin 2. 1:10pm to 1:50pm. Free. All welcome. No booking required. Tuesday 15 April: The structure, demise and legacy of landlordism in County Cavan, c1870–1970, with Dr Jonathan Cherry. Host: Cumann Seanchais Bhreifne. Venue: Johnston Central Library, Cavan. 7:30pm. Free. All welcome. Tuesday 15 April: Launch of the Irish Association of Professional Historians. Venue: Academy House, 19 Dawson Street, Dublin 2. Advise attendance by email. Tuesday 15 April: DNA, with George Gordon. Follows AGM. Host: North of Ireland Family History Society, Omagh Branch. Venue: Omagh Library, Dublin Road, Omagh. 7:15pm – 9:15pm. Wednesday 16 April: When the war is over: John Redmond’s Home Rule Army and the early months of World War I, with Dr James McConnel. The 3rd annual T K Daniel Lecture. Host: The School of English and History, University of Ulster. Venue: Room MD007, Magee College, L/Derry. 6:30pm. All welcome. Followed by a wine reception. 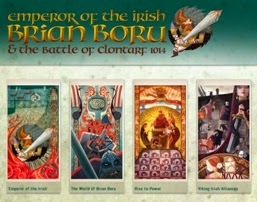 Thursday 17 April: Brian Boru – the last great high king of Ireland, with Dr Catherine Swift. Host: Clare Roots Society. Venue: Civic Rooms, Ennis Town Council, Drumbiggle Road, Ennis, Co Clare. 8pm. €5 for non-members. All welcome. Saturday 19 April: Family history Help Session, with Mike Carragher, at 10am, followed by Fact, Fiction, or Fish Tale? with Kathleen McGee at 11am. Host: Irish Family History Forum. Venue: Bethpage Public Library, 47 Powell Avenue, Bethpage, NY, 11714. Tel: (516) 931-3907. The National Archives of Ireland has advised the temporary closure of some of its archives as a result of continuing refurbishment works. The records affected are held in the National Archives' Four Courts storage area and will be off-limits on certain dates between Wednesday 16 April and Friday 9 May. The National Archives plans to complete the Four Courts works in 2014. GRONI's new online service for Northern Irish births, marriages and deaths is taking its second 'Scheduled Maintenance' break in two weeks. Let's hope they're not going to make a habit of these unannounced downtime sessions. IDEA!! If it's really 'scheduled', how's about putting a note on the site in advance? Or even better, writing a few words on the holding page saying how long the downtime is likely to be? The Public Records Office of Northern Ireland will host a special book launch relating to the Plantation of Ulster on Monday 12 May. 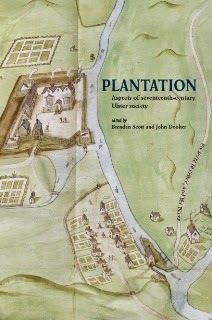 To mark the launch of this book, Dr. Brendan Scott, one of the book’s editors and contributors, will give a talk, discussing common understanding of the Plantation's historical consequences, and demonstrating how this new publication will enhance awareness of an event which changed Ulster and Ireland forever. Admission to the event, which will be held at PRONI's Titanic Boulevard offices in Belfast, is free but booking is essential. You can reserve a place by email or by telephone on (+44) 02890 534800. The Irish Association of Professional Historians will launch next Tuesday, 15 April. As it's name tell you, the association is for professional historians (those with a PhD or those who have made a significant contribution to historical studies) and graduate historians (those enrolled in a PhD programme). Membership is open to those who have trained or are working in Ireland as well as international historians and scholars with an expertise or interest in historical studies. Membership fees are set at €50 for professional historians; €25 for 'early career' or unwaged professional historians; and €25 for graduate historians. The official launch of the association and its website, www.iaph.ie, will take place place at Academy House, 19 Dawson Street, Dublin 2 next Tuesday at 6pm. 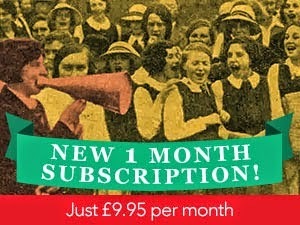 Prospective members can join on the night (cash only) or through the website (click logo). FindMypast has launched 100 in 100, a plan to release 100 record sets in the next 100 days. This ambitious initiative will see millions of new records, many of them exclusive to FindMyPast, newly available to subscribers. Among them will be military, census, parish and civil records, and no doubt many other types of collections. Irish records will feature in the mix. 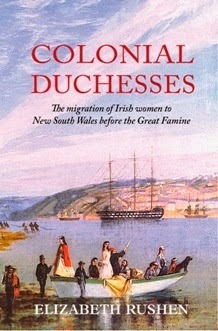 A new book, Colonial Duchesses by Elizabeth Rushen, tells the story of migration of Irish women to New South Wales before the Great Famine. In just two years, 750 young Irish women sailed from Cork to Sydney &ndash on the Duchess of Northumberland in 1834 and again in 1836, and the James Pattison in 1835. 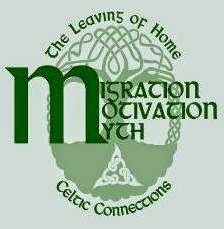 For the women who took the courageous decision to emigrate, the pain of leaving Ireland was mixed with the excitement of forging a new life in the colony of New South Wales. This book, published by Anchor Books Australia, examines the backgrounds and lives of these young women whose experiences are representative of countless single women who migrated to Australia during the 19th-century. It is to be launched by Dr Ruth Adler, Australian Ambassador to Ireland, at O'Connell House, Keough Naughton Notre Dame Centre, 58 Merrion Square South, Dublin 2, on Wednesday 23 April, 6pm–7:30pm. If you wish to attend, please email by 21 April. 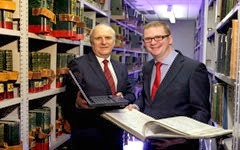 The Public Records Office of Northern Ireland is in the process of uploading recorded videos from its highly-regarded and popular “Exploring Your Archives in Depth” workshops that were held in PRONI in January/February of this year. All other recorded talks will be uploaded to the PRONIonline channel in due course. 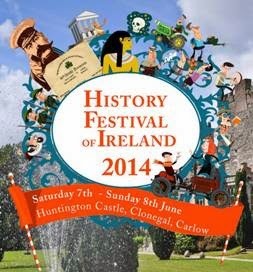 The History Festival of Ireland will take place on the weekend of 7–8 June at Huntington Castle, Clonegal, Co. Carlow. Now in its third year, this summer's event is being curated by Angus Mitchell and will see 50 well-regarded historians and thinkers from Ireland and the UK contributing to more than 40 discussions, interviews and performances. A dedicated stage will see an in-depth two-day exploration of World War One, there's a History Ireland Hedge School and a number of presentations specially for the Vintage Car or Motoring enthusiast. A day-ticket costs €22.50 and provides access to all events being held that day. Parking is free and food and refreshments can be purchased on site. Find out more on the History Festival of Ireland website. In advance of the Giro d’Italia 2014 coming to Belfast’s Titanic Quarter in May, PRONI’s Document of the Month for April features a motley crew of Victorian cyclists in fancy dress who were participants in a cycling gymkhana. Dated 1895, the photograph comes from the family papers of Samuel Cleland Davidson of Seacourt, Bangor, founder of the Sirocco Engineering Works in Belfast. It appeared in an 1896 edition of Sketch magazine. Garth Stewart, who selected the document said: “With the Giro coming up, this image jumped out at me! The enigmatic dress and posture of the figures is fascinating, as is the gymkhana’s undefined location somewhere in Belfast, which is described simply as a “floor used for dancing”. 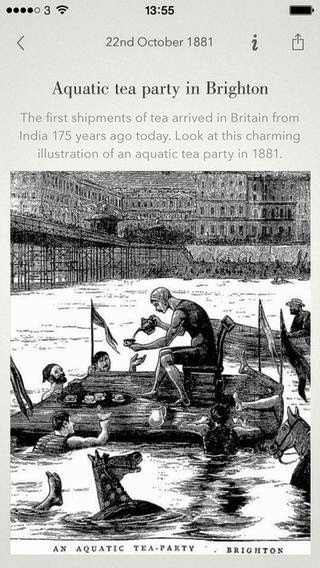 I was even intrigued by the use of the word ‘gymkhana’, an Anglo-Indian term for an ‘athletic sports display'. “The cyclists are captured in highly varying forms of fancy dress; from a matador to a sailor, from jesters to military personnel. Indeed, one gentleman is in full army regalia, but it is unclear whether he is part of the festivities or just keeping a watchful eye on proceedings! The photograph (from the Davidson family collection, Ref: D3542/E/2A) is just one of a rich array of cycling related items owned by the Public Records Office of Northern Ireland, a small selection of which will be exhibited at both PRONI's Titanic Boulevard HQ and website as part of the Giro celebrations.